the baking paper over and place it on the tray. Sift cornflour and icing sugar together. Whisk the egg whites with the cream of tartar until you reach a firm peak and gradually add in the caster sugar, whisking for a minute to dissolve the sugar. Remove from the mixer and fold through cornflour and icing sugar mixture. Place an 8mm-10mm piping tube in a piping bag and pipe discs using the marked circles as a guide. With the remaining meringue mixture, pipe individual meringue kisses with one quarter of the mixture onto a lined flat tray with a 10mm piping tube. Add a small amount of green colour to create a pastel green finish and pipe one third of the remaining mixture into kisses. 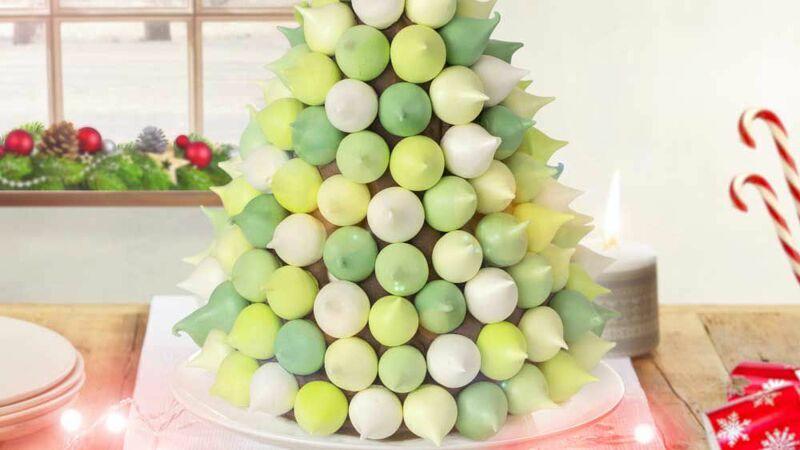 Add additional green colour and pipe half into kisses, once again add more colour to the remaining meringue and pipe into kisses. Bake for approximately 1 hour and 30 minutes or until the meringue is crunchy. Set the chocolate cream aside at room temperature for 40 minutes or in the fridge for 10 minutes until it firms up enough to hold. with chocolate cream by piping it on or spreading it with a knife. Alternate the different coloured meringue kisses and place them on the outside, adhering them to the chocolate cream. This can be finished up to 5 hours in advance. Note: The meringues can be stored in an airtight container for a week prior to assembly. This entry was posted in Christmas, Recipes and tagged baking school, becoming a chef, callebaut, callebaut chocolate, chocolate, cooking classes, cooking classes melbourne, cooking course, cooking courses, cooking school, how to become a chef, how to make chocolate, kirsten tibballs, melbourne, pastry chef, pastry courses, pastry school, savour chocolate and patisserie school, savour online classes, savour school, top culinary schools on December 22, 2017 by admin. For the gingerbread, in a mixer bowl with the paddle attachment add in the flour, caster sugar, gingerbread spice, honey and butter. Mix with the paddle attachment until combined. Dissolve the bicarbonate of soda in the hot water and add it to the mixture, continuing to mix until all of the ingredients are incorporated and it comes together as a dough. Roll out the dough to approximately 4mm thickness on a surface lightly dusted with flour. 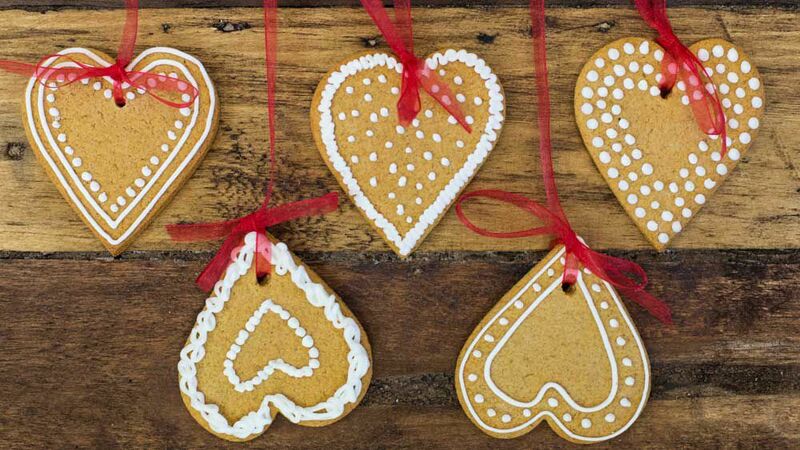 Cut the gingerbread shapes and pierce with a hole to allow for ribbon. Place cut out shapes onto a lined tray. Bake at 170°C for 7-8 minutes. For the royal icing, place the egg whites in a bowl and mix through the sieved icing sugar. If needed adjust the icing by adding more egg white or icing sugar until you have a firm piping consistency. Royal icing sets very hard very quickly, so keep it covered and in the fridge when you are not using it. When ready to use, place the icing in a piping bag with a small round tip. Pipe the prepared royal icing onto the biscuits and set aside to set. Thread with ribbon and tie with a bow. This entry was posted in Christmas, Recipes and tagged baking school, becoming a chef, callebaut, callebaut chocolate, cooking classes, cooking classes melbourne, cooking course, cooking courses, cooking school, how to become a chef, how to make chocolate, kirsten tibballs, melbourne, pastry chef, pastry courses, pastry school, savour chocolate and patisserie school, savour school, top culinary schools on December 20, 2017 by Kirsten Tibballs. Yield 10 cups at 30g per cup. In a medium saucepan bring the water and the sugar to a boil to make a syrup. Add the pre-soaked gelatine, citric acid and lastly the apple juice. Deposit 30g into each cup. Allow to set. Yield 86 cups at 15g per cup. In a large bowl mix the oats, almonds, cashews, coconut and sugar until combine. Warm the honey with the oil and pour over the oat mixture. Spread mixture out onto a silpat mat and bake for 60-70 minutes at 120°c 5turning every 15 minutes to ensure an even bake. Remove from the oven and stir through the dried fruits. Store in airtight container. Deposit 15g per cup. Whip the cream with the sugar and vanilla until medium peaks. Fold thought the yoghurt. Deposit 35g of the mousse on top of the granola. This entry was posted in Recipes, Verrines and tagged baking school, becoming a chef, callebaut, callebaut chocolate, chocolate, cooking classes, cooking classes melbourne, cooking course, cooking courses, cooking school, how to become a chef, how to make chocolate, kirsten tibballs, melbourne, pastry chef, pastry courses, pastry school, savour chocolate and patisserie school, savour online classes, savour school, top culinary schools on December 14, 2017 by Kirsten Tibballs. For the shortbread, combine sifted flour and butter to form a crumb. It is important that you do not over mix at this stage. Combine sugar, water and egg and add to the crumb mixture combine until smooth dough is formed without excessive mixing. Allow to rest in the fridge and roll out once the dough has firmed up again. For the filling, dice the fresh and dried fruit to approximately 8mm. Melt brown sugar in a pan with the orange juice and add in the diced mango and pineapple. Then add in the gingerbread spice. Cook on a high flame and add banana and the dried fruits. Add the vinegar and reduce until you achieve a chutney consistency. Place the prepared chutney into a bowl and cover with plastic wrap and allow to cool. To assemble, roll the prepared shortbread pastry to a thickness of 3mm and cut 30 x 80mm discs for the base. 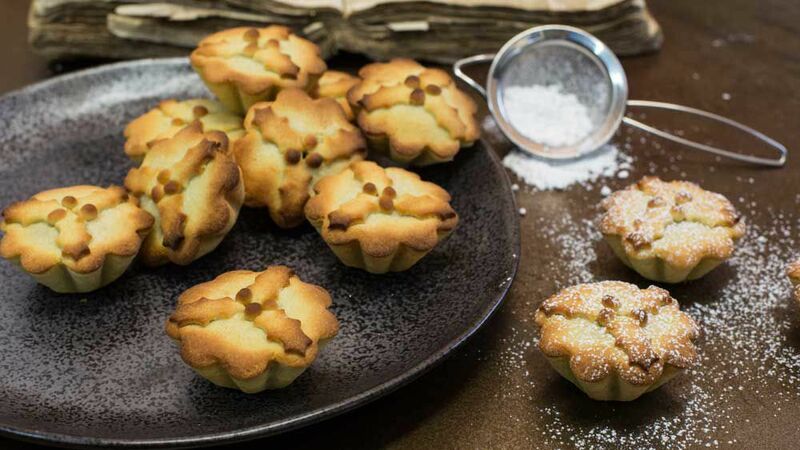 Line individual tart moulds 60mm in diameter and height 23mm, with the pastry and fill with the cooled fruit mince. Roll the remaining pastry to 3mm thickness and cut tops for the tart with a 60mm round cutter. Place the cut pastry disc directly on top of the fruit mince and press the edges to remove the excess pastry. With a small knife puncture a small hole in the top of the pastry. Roll additional pastry or keep your offcuts flat and roll out to a 2mm thickness, and with a holly cutter cut three holly leaves per tart. Using a brush place a small amount of water on top of the tart to adhere each holly leaf. Create three small holly berries per tart with the left over pastry and place in the middle of the tart. Bake at 200°C for approximately 8 minutes. Remove from the mould while they are still warm. Store in an airtight container at room temperature. This entry was posted in Christmas, Recipes and tagged baking school, becoming a chef, callebaut, callebaut chocolate, chocolate, cooking classes, cooking classes melbourne, cooking course, cooking courses, cooking school, how to become a chef, kirsten tibballs, melbourne, pastry chef, pastry courses, pastry school, savour chocolate and patisserie school, savour online classes, savour school, top culinary schools on December 8, 2017 by admin.